Astronotus ocellatus common name tiger oscar. They can grow over 30 cm /11 to 12 inches fully grown. They are best kept in water parameter of PH range 6.8-8.0, and temperatures of 22-27 Celsius / 72-80 °F. 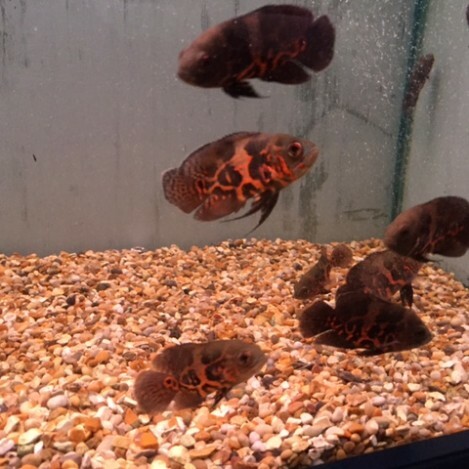 There are different colour oscar available, red, red tiger, and albino tiger. They all have the same behaviour. 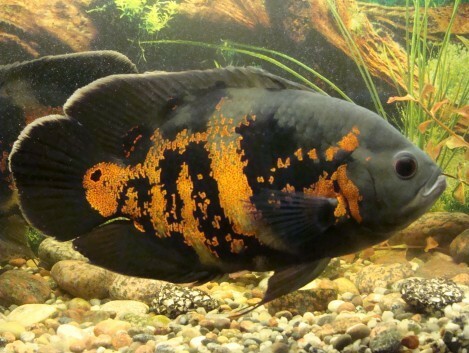 Oscars are a type of cichlid fish, and can be very aggressive. They are best kept in either single, twos, or threes. To mix with any other fish is always a risk. They can be very aggressive to one another and other tank mates. So really try mixing them with other big aggressive fish whilst they are smaller. But again it is a risk. They will eat any food you put in the tank for them. The best foods for them are colour enhancing foods, to help keep there colours nice and bright. Usually pellets are the best, as they are more substantial than flake. Also they do need meat in there diet so frozen foods like mussels or lance fish, or any food you have left over on your plate, like ham, cooked chicken. They need to be kept well fed as they will attack each other if they are hungry. 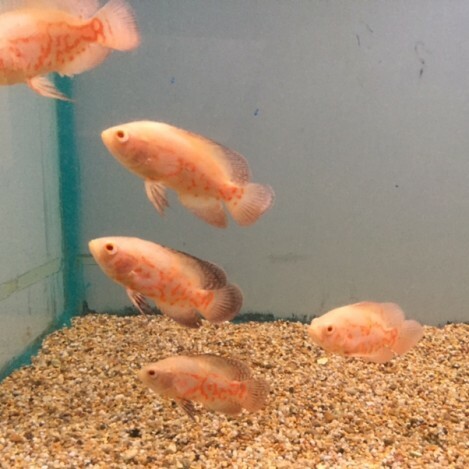 Oscars are dirty fish, so you may find the more you feed the more water changes you will have to do as they produce a lot of waste. Be warned they do have a nasty little nip and if they get hold of your finger it can be sharp. Oscars can get massive sizes, they will try to eat any food you put in the tank for them no matter what size. They will eat one another if not well feed. They will eat any food you put in for them. Colour enhancing food is best like pellets and also meat like frozen mussels and lance fish. They will need feeding once to twice a day at the most.